You may recall from previous posts, my scraps of information on ‘azulejos’. 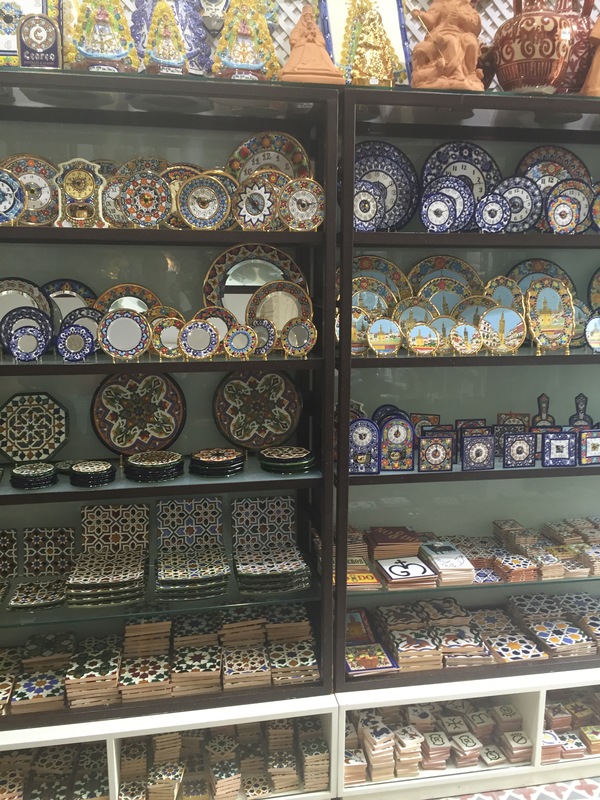 Essentially, ‘azulejos’ are beautiful ceramic tiles made here in Sevilla. They can be found inside every home, on the streets, inside the churches, and sold in stores all over town. 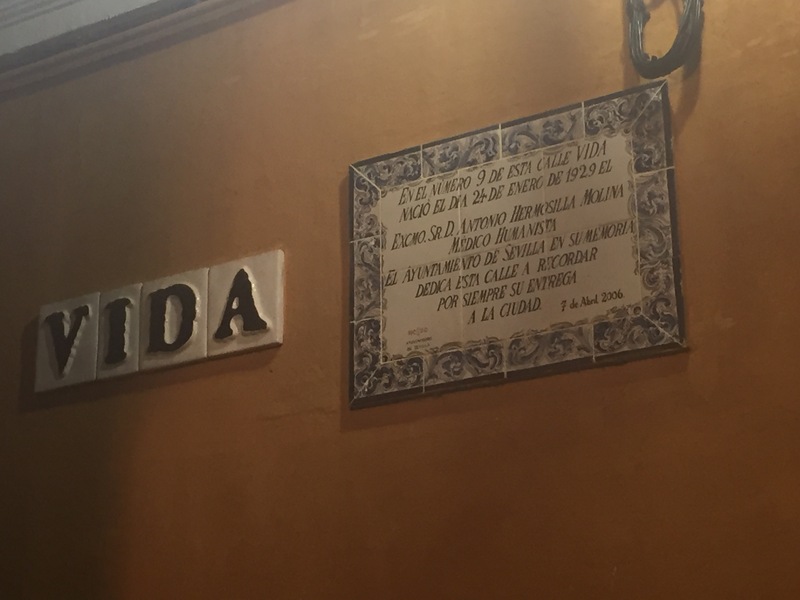 And, Sevilla has been celebrated for the creation of azulejos since Roman times. When and if I stop this globetrotting and settle in one place, I’d love to decorate with these beautiful tiles. 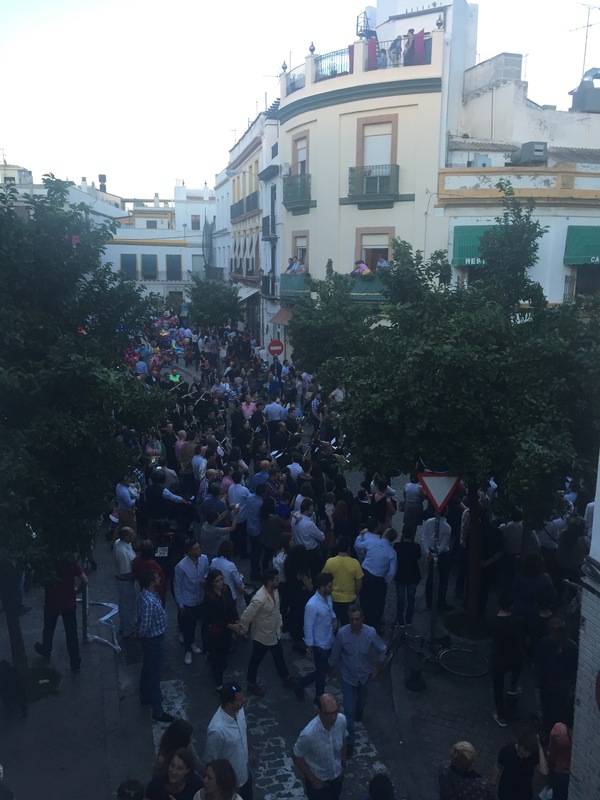 I live in ‘Triana’ which is a fasinating, historical barrio (neighborhood) in Sevilla. There is a museum located in the old tile factory here and MaryCarmen and I decided to meet there on Saturday for a visit. The Museo, formally the ‘Santa Ana Factory’, illustrates the ceramic making process using the four elements: Earth (the mud), water, fire, and air. The Santa Ana Factory opened its doors in 1870 and was a staple here until 2014. It gets its name from the patron Saint of Triana. Also, inside the Museo, is a room devoted entirely to Triana. The people with deep roots in Trianna are called ‘Trianeros’ and they strongly identify with their barrio! Sort of like myself when I tell people I am from ‘Cranston’. Raquel grandfather was a skilled potter and worked all of his life in the Santa Ana factory. The name for this job position is ‘alfarero’. These people truly amaze me. Inside the Museo, they play a black and white movie showcasing these workers giving their commentary of their life working in the factory. MaryCarmen and I sat and watched this short, very moving, movie. MaryCarmen inside ‘Centro de la Cerámica de Triana’. 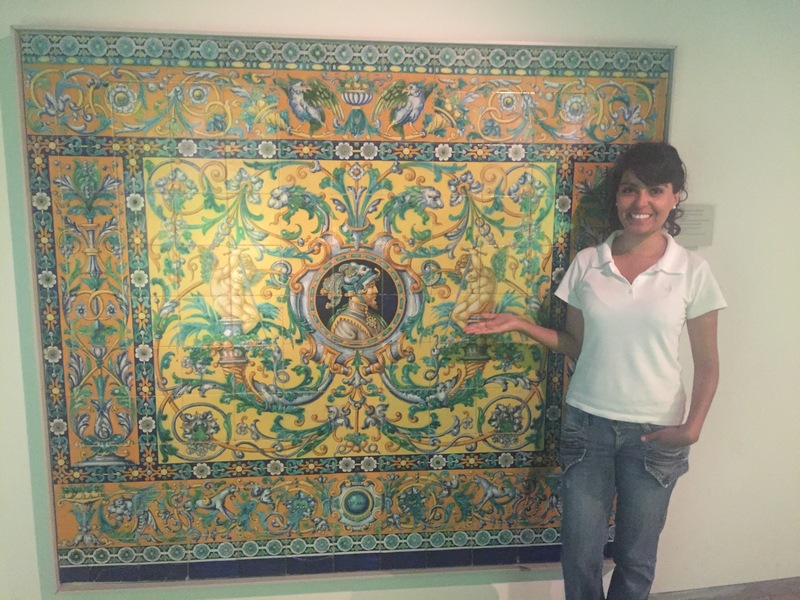 We spent hours in the museo learning about the history of the azulejos and Trianna. Then, just as we were getting ready to leave, we hear ‘the music’. They were moving a Virgin! This music always coats both of us with goosebumps! We love it! The night before Manuel told us that they would be moving a Virgin today, but I had lost track of time. We heard the music, took one look at each other, and immediately starting searching a way towards the vicinity of the band. We pussyfooted our way onto a balcony and closed the door behind us. Now we had a prime spot and it was fantastic! They view from the balcony at the ‘Centro de la Cerámica de Triana’. We were watching the band and Virgin. We stayed and watched the band and took it all in for several minutes. And then, at the same time, we both realized that we should physically proceed OFF of the balcony of the Museo before we got caught. So we did. And, we left and made our way through Trianna to get home for dinner. 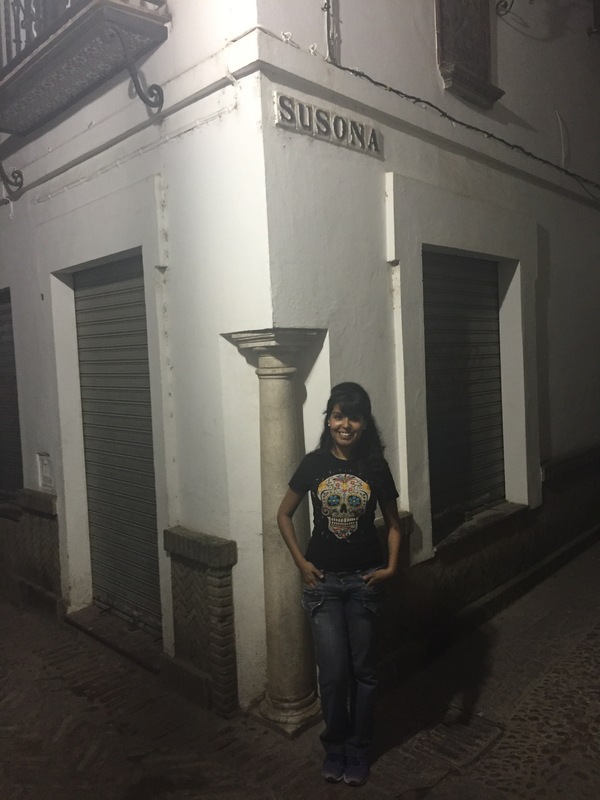 On Sunday we went on another adventure to ‘Susona’s Street’. This came about because I have a never-ending, constantly growing list on things to do in my iPhone notes. I literally have enough material to keep this blog going for the rest of my life-not including all the stuff I still will see! It panics me to think about it actually. It really does! There is just so much to see and so much good food to eat and so much to learn in this world that I can’t even stand it!! Susona, a beautiful Jewish Sevillian girl, had a secret romance with a Christian man. The legend transpired in the 15th century and Jews were going through incredibly grueling times in Spain. The Jews were being coerced to convert to Christianity. And, in an effort to give the Christians a taste of their own medicine, the Jews called a meeting to plot their revenge. One of the leaders of this conspiracy was Diego Susón, the father of Susona. It was at his house that the Jews met to sort out the details of their vengeance. Well, Susona heard their entire plan. She ran to her lover and in fearing that he could be killed, she divulged everything. As a result, Susona’s father and his entire crew of Jewish leaders were executed. Susona had immense remorse and shame for what she had done. Some people tell me that Susona hung herself. Some people tell me that Susona never left her house again. Some people tell me that she lived the remainder of her life in a convent. However, regardless of how she spent the rest of her years, her final wish stands true. Susona’s last will in her testament was to have her skull placed at the door of her house. And, it was here that the skull remained, well into the 18th century. The Jewish Quarter in Sevilla. 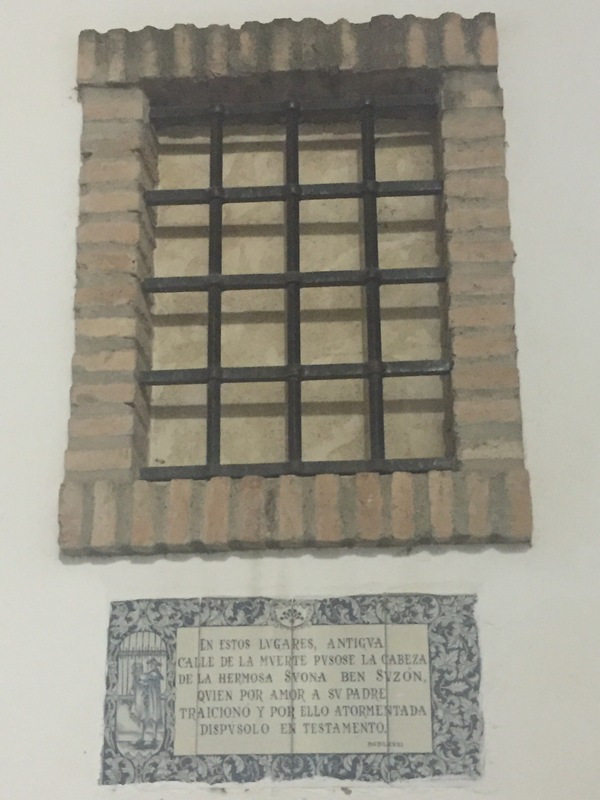 The plaque on ‘Susona’s Calle’ and the spot where the skull was kept until the 18th century. MaryCarmen at the top of ‘Susona’s Calle’. 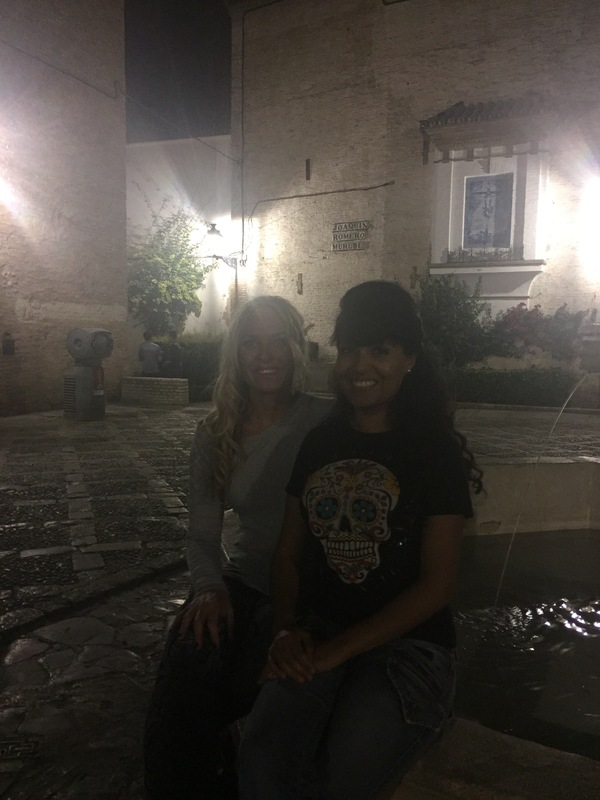 MaryCarmen and I at the fountain in the ‘Jewish Quarter’. Previous Previous post: Kortrijk and Ghent….Domingo y lunes in Bélgica. Next Next post: We didn’t eat Castañas but we did visit the Smurfs!